GB's brief was to put first class sound in every seat in the house, whilst maintaining clear sightlines. 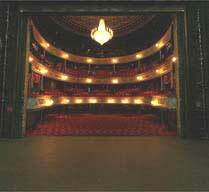 In a classic four tiered theatre with raked seating and low ceilings, consistency of sound can be difficult. 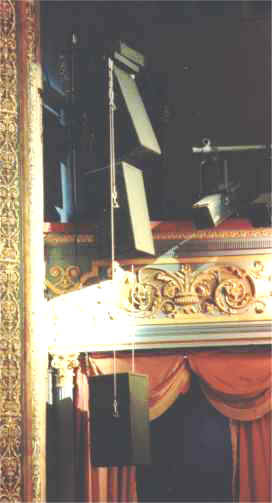 Graham Bodenham, Head of GB Audio designed a flying vertical array of Shermann 401 speakers, placed directly in front of the proscenium pillars on each side of the stage. Each pair of speakers set at an upward angle matching the rake of each tier of seating, enabling the sound to project to every seat without the need for clumsy under-balcony fills and all the technical complications that they bring. An added effect of keeping the sound as close to the stage as possible is a greatly improved stereo image. 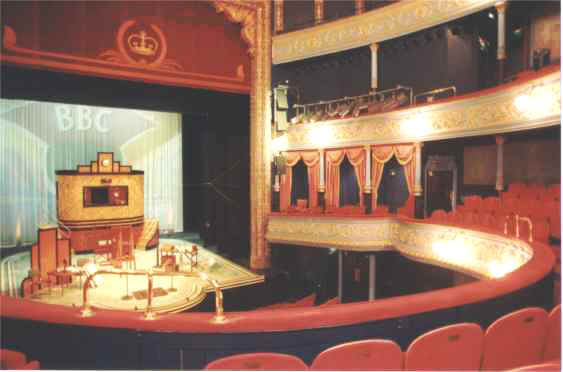 However, because the proscenium walls, the ceiling and balconies are clad in ornate plasterwork with protected status, a bespoke flying system had to be designed which would support the entire speaker system without touching any decorative surfaces. In conjunction with Ken Hughes, Designer of Shermann loudspeakers, a custom flying frame was devised which could be manufactured in the Shermann factory in Wales and fitted quickly and easily on site. "Ken's great at this sort of thing" commented Graham Bodenham. "There aren't many manufacturers who will support their own products to this degree (excuse the pun). We often need special flying kits or modified brackets to achieve the optimum loudspeaker placement and Shermann are always ready to help". Another key feature of the system design is the choice of three mixing desk positions for the 32 channel Soundcraft K3 (rear stalls, gallery and control room) with comprehensive patching ability in the control room and rack room. top A rack of robust Roland SRA800 power amps are driving the system with a rack of Roland graphic equalisers tailored to the room Eq. Other front end control equipment from Denon, dbx, Tascam and Yamaha is housed in a set of handy mobile racks which can be easily moved between control positions and other work areas. 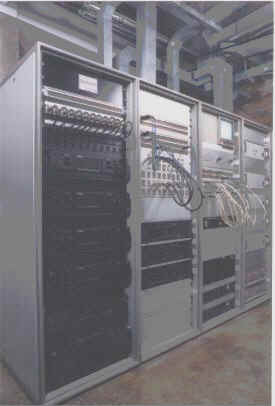 (The two racks on the right contain comms and video distribution and induction loop systems, previously installed by Northern Light).